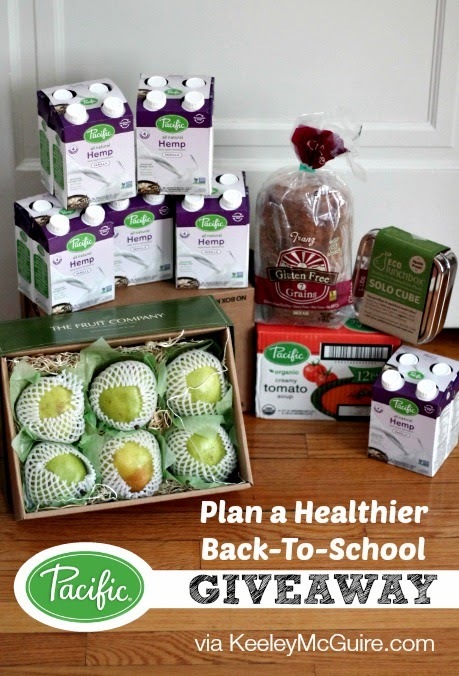 Welcome to Day 2 of our Pack a Healthier Lunch week thanks to Pacific Foods! In case you missed yesterday's post, we kicked off the week by starting a giveaway and including a yummy recipe for gluten free & allergy friendly Tomato Soup Carrot Muffins. Be sure to check it out! 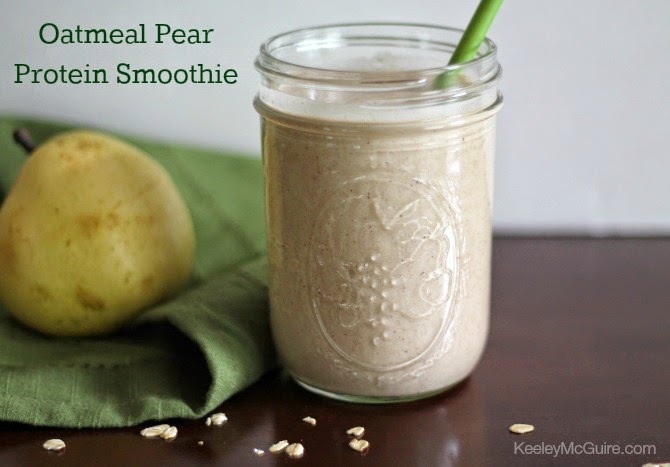 Today's recipe is one of my favorites: A smoothie! I make myself a smoothie almost every single day. Sometimes I make them fresh in the morning and drink them on the way to work. Other times I make a big batch ahead and freeze them in plastic freezable jars so that they're perfect by lunch. That's what's so great about our recipe today - Enjoy it fresh for breakfast or make it ahead and freeze for lunches! Filled with protein and fresh fruit, it's sure to be a hit with your family! Little Miss loves this recipe. She said it tasted like creamy oatmeal, but not too sweet. She's kinda funny about overly sweet things, especially in drinks or smoothies. 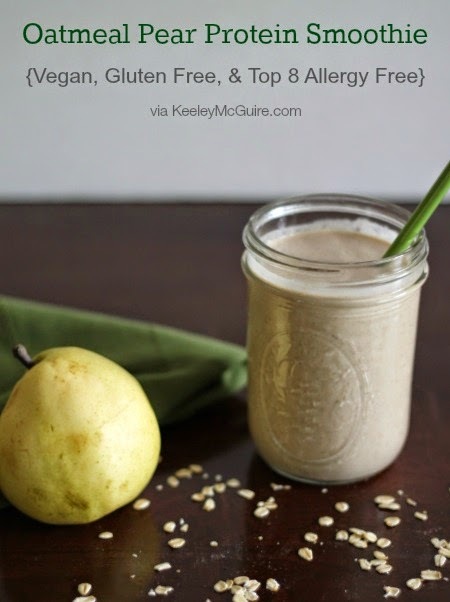 I love that it's full of protein, filling, Vegan, gluten free, and top 8 allergy free. Like I said, it's delicious a great breakfast before school since you know it will give your family the fuel they need to get through the mornings. It's also great because it can be drank on the go - since we ALL know what school mornings are like... I'm usually thankful we have matching socks on. Invest in some freezable jars and you can make this + other smoothie recipes that are great for school & work lunches, as well. Want to know more? I did a post recently over at MOMables about "How to Freeze Smoothies". Check that out for more tips! So simple to make. Put all your ingredients into a blender or food processor and VOILA! Instant delicious smoothie. 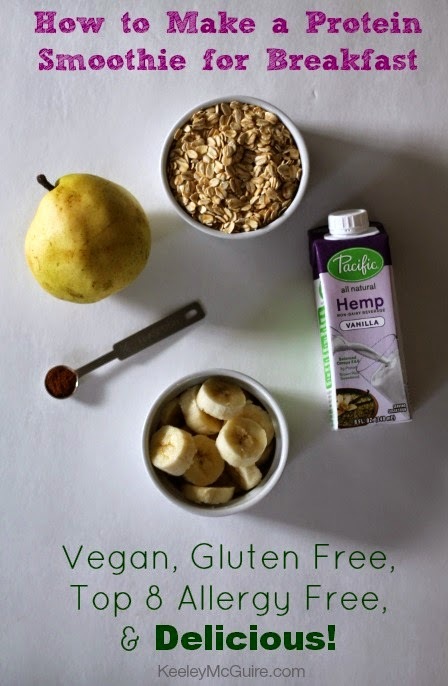 We made ours using Pacific Foods Vanilla Hemp Milk. It's delicious and so incredibly good for you! Full of protein, calcium, Omega 3 & 6. It's also Non-GMO verified. The recipe widget is at the bottom of this post to print, along with a clickable link in case you cannot view it on your mobile device. Having trouble viewing the recipe widget? View it directly by clicking HERE. My biggest struggle is to pack a balanced lunch of fruits, veggies, protein and carbs for my picky and gluten free child. I love all the ideas on your blog! We will definitely try the tomato soup carrot muffins and the delicious smoothie!! Packing for 3 of my kids in the AM with different tastes sure is my challenge this would be an amazing giveaway. Thanks so much for the chance. My biggest stuggle is trying to pack for my picky eater. Last year we found out that he is allergic to peanuts and tree nuts. So his diet has changed a lot. Trying to find foods that are free from nuts, that he will eat is hard. Biggest challenge, trying to diversify lunh packing. I tend to get stuck in a food rut very easily. The "must have something absolutely different every day" eater.